Domain has listed the 10 best houses of the year. Which is your favourite? Perhaps we should have a competition for the best project and/or the best house of the year among Workshop members? @RenoQueen, am I seeing right that the pool waterline seems to reach to the doorway access points in your featured pic? My choice is either the Hunter Valley Farmhouse, or the Bundeena house. Agree @Isobel on your hate pick, it looks like a colon bypass. Wowsers, this garden integration is stunning. Must've been a lot of work involved in protecting the home. This, too, is gorgeous. Wouldn't work in my home, but I'd sure as hell love to explore something like this in our next place. Bit of a shame there weren't more photos in the article... could've been a great gallery opprtunity. The Design Files does a much nicer job of that sort of thing! G'day @mikedoeslife, welcome to the Workshop family, love yah mate, you & I are gonna get along just fine. 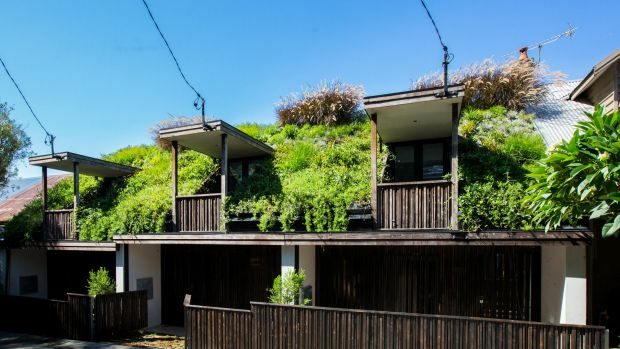 I love the concept of garden rooves, but the posted illustration doesn't ring my bell. Thing is, it's a very steep pitched roof, & I suggest, it's basically for decoration. Major gripes for me, are that it'll require tending to (maintenance), ocassional watering, & it isn't the least bit productive, food wise. And damn, don't those overhead wires look ugly to you? The 2nd pic is a blot on commonsense/design ettiquette, crikey, there isn't a voice activated gigantic OLED in sight, the cushions aren't designer scrunched, nobody's enjoying the room except for the uninvited insects, the lighting looks like it fell from the floor above, & those shelves aren't practical. Anyways, it's great to meet yah mate, I'm graphic, I design, loved cycling, & I'm also a low level tech guy too. Nah, I reckon it all looks great! Perhaps I lack the experience to know better, but on the face of it, I like everything I'm seeing there! @mikedoeslife, we're good to go mate, & you're in luck, I'm extremely patient, & a good teacher, I'll lift your standards eventually. I might have to lean on you for some tech advice, does that sounnd fair? You're a beer drinker, right? @mikedoeslife, I'm encouraged by that mate, be prepared to better yourself in other areas under my tutelage. I tell yah, this is gonna be a hoot of a ride, strap yourself in. Dumb question, but just to clarify another point, when you say cyclist, you're talk'n human powered sweaties, not Hogs?